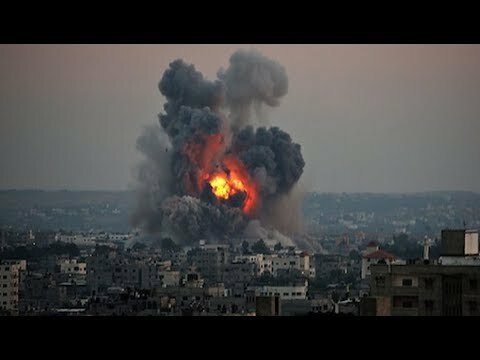 TRNN Middle East correspondents Yousef al-Helou and Lia Tarachansky discuss the ongoing Israeli military operation against Gaza, now dubbed "Operation Protective Edge"
Israel has called in 40,000 reservists as it continues its military offensive against the Gaza Strip, now dubbed Operation Protective Edge. This comes weeks after the murders of four teens, three Israeli and one Palestinian, in separate incidents, and is one of the most intensive military action against the Gaza Strip since Operation Pillar of Cloud in November 2012. As we go to recording, at least 50 targets have been hit in Gaza in the past 24 hours, with dozens reported killed and injured, and hundreds of rockets have been launched at Israel from the Gaza Strip, reaching as far as Tel Aviv. Joining us now to give an update on the situation are our two Middle East correspondents, Lia Tarachansky and Yousef Al-Helou [from London]. YOUSEF AL-HELOU, TRNN CORRESPONDENT: It’s my pleasure. Thank you for having me. LIA TARACHANSKY, TRNN MIDDLE EAST CORRESPONDENT: Thanks for having me. WORONCZUK: So, Lia, Israeli Prime Minister Benjamin Netanyahu has been widely quoted as telling the Israeli Defense Forces to, quote, “take off the gloves” in regards to its military offensive against Hamas in the Gaza Strip and that a ground operation is being seriously considered. What are Isreali officials saying right now about the scale and the plans for the military offensive? And what appears to be Israeli public opinion regarding the offensive? TARACHANSKY: Yeah. So, first of all, any Israeli politician knows that a ground offensive is a death sentence politically. So I think he’s very, very careful. I think that we have a huge gap here between what the top-level leadership is saying and what they mean. So, first of all, from speaking to IDF spokespeople following the statements by various chiefs of–the chief of staff, the head of homeland security, etc., you hear conflicting statements, all of which are saying, basically, one common thing, which is: we’re leaving the door open for anything. Just about 45 minutes ago, the army’s chief of staff, Benny Gantz, said, we need to continue our operation as long as it takes and as long as the political situation permits us to. And in an interview earlier today with the journalist Jesse Freeston, an IDF spokesperson said that all options are on the table in various forms. So what we’re seeing here is that there’s been a naval attack, an aerial attack, and the deployment of 40,000 reservists. They’ve been bombing Gaza during the day for the first time this morning in an operation that’s called in the Israeli press Operation Solid Rock. And as usual in these situations, the Israeli press coordinates directly with the army and with the government. And as I opened the paper this morning, I saw the top journalist, the top security journalists, such as Malcolm Balen and Alex Fishman, saying that this is going to be a gradual operation and it will probably take a long time. Later on in the day, government officials have used those exact same words. So we don’t know how long this will last, but it seems that they’re trying to keep all doors open. WORONCZUK: And, Yousef, what is the latest regarding the deaths and injuries as a result of the Israeli airstrikes in Gaza? AL-HELOU: Israel’s ongoing military assault (dubbed Operation Protective Edge) against Gaza continues to claim more lives for the second day in a row. The death toll has risen to 15 Palestinians killed so far and over 100 injured. Now, Israeli warplanes, joined by artillery, tanks, warships, take part in the ongoing aggression, pounding various sites throughout the besieged Gaza Strip, the Gaza Strip, which is home to nearly 2 million people, half of whom are young people below the age of 20, in what is commonly known the world’s largest open-air prison. Now, amongst the targets hit in the past 42 hours by Israeli warplanes, including American-made F-16 jets (this is how people describe these warplanes): a number of residential houses. In one incident, for example, today, a two-story building was struck as a family was in the house at the time of the attack. Also, local neighbors who gathered to form a human shield were present at the time of the attack. This method is used by Palestinians to deter or to prevent the warplanes from bombing [incompr.] house. Normally the Israeli military or the Israeli intelligence make phone calls to the occupants of the house to order them to evacuate. In another–there’s another way how the Israeli Army orders the occupants of the house to leave, which is a message called “knock on the roof”, which has been used in the previous two wars in Gaza in 2008, 2012. Normally an Israeli drone fires a small missile on the rooftop of the house as a message to the family to leave and run for their lives. Now, Israel says that these houses [are] owned by resistance groups, but we have seen today a number of members of the family were killed as they were inside the house fasting, they were waiting to break their fast. Now, Israeli airplanes fly over Gaza around the clock, and yesterday the Israeli army intercepted the signals of a local radio station, Al-Aqsa–it’s the radio station which is owned by Hamas–and broadcasted recorded warning messages. Now, in another development, the resistance groups, mainly Hamas and Islamic Jihad, fired tens of retaliatory homemade rockets, including long-range rockets that were intended to strike the Israeli [depths? ], such as cities, such as Tel Aviv, Ben Gurion airport. And now Israel opened its shelters in Tel Aviv, and this is a signe that means the ongoing military aggression could escalate further and we could see more retaliation from Gaza. Now, the latest, according to Hamas–they issued a statement saying that their main conditions is–I mean, they are willing to halt the firing of the firing of homemade rockets from Gaza if Israel stops immediately its aggression in the West Bank–this is how they said–and also to release the Palestinian political prisoners who were rearrested in the past three weeks following the murder of three Jewish teens. Now, these prisoners who were rearrested in the past three weeks, they actually were released during the famous exchange deal that sought the release of Gilad Shalit in exchange for over 100,000 Palestinians. Now, mediation efforts have failed so far to put an end to the violence around Gaza, and this is because the relationship between Egypt and Hamas is very tense. Now, if you ask me about how people feel, of course people are terrified, they are panicking, they are, you know, afraid from the worst to come. They are suffering from daily power cuts. It’s hard. And they are fasting during the day. At night they cannot sleep because the sounds of bombs is really miserable and shaky and it’s very scary. I covered the first war, the second war, and this one, I mean, the bombardment is really heavy. In another way, I would like to say that, you know, Gaza cannot take a third war. I mean, the Gazan population is already exhausted. They have been living under miserable situation for the past seven years. Can you imagine poverty, the economic situation? They cannot leave. And, by the way, Gaza–I mean, Gazans cannot leave now, because the main crossing, Rafah Crossing, has been closed by the Egyptians. So it’s a miserable situation and Gaza is a killing zone. So we could see more casualties if Israel continues to pound Gaza. WORONCZUK: Lia, the IDF spokesman Lieutenant Colonel Peter Lerner was cited by Reuters as saying Hamas chooses “the direction of escalation, so the mission will go on as long as we feel it is necessary to carry it out. We don’t expect it to be a sort mission on our behalf.” What’s your response to that statement? TARACHANSKY: I think that that’s exactly the point, and I think there’s such–why there is such coordination in the very words used by the Israeli press and by the leadership and the security echelon, that, you know, journalists come here when there’s a lot of action, but the actual impact of the occupation, the actual impact of Israel’s war on Gaza is what happens in between these dramatic events when the journalists go home. You know, the Gaza Strip is bombed on and off all the time, almost every week, sometimes every day. The occupation is continuing to intensify and becomes–and all of the tools, the violent tools of the Israeli army are used against Palestinians every single day. So they know that journalists will follow the dramatic actions but they won’t stay forever. And so if this continues at, let’s let, a medium level for a number of weeks, they can do whatever they want for as long as they want because they know the journalists will eventually get bored and go home. Other conflicts will probably drive them elsewhere. Now, here in Israel, the way that the Israeli press has been reporting on this is all day long–the Israeli Army Radio, which is the most listened to radio in the country, the Israeli television, and newspapers have been hosting, basically, back-to-back either military personnel, think tank experts, and psychologists that are advising Israeli citizens what to do. And, of course, the way that it’s being reported is very terrifying. They’re talking about the traumatic effect of having–of children sitting through alarms. Journalists in Israel are not allowed, by gag order by the military censor, to report where rockets are landing because this is considered giving information to the enemy, so instead they can only report where they hear sirens. And so all day long the Israeli press has been saying that sirens have been heard in every single municipality in the South, as far up north as /fuˈlon/, and now in Tel Aviv, which is where we are. And the department of homeland security has issued a warning to everyone who’s within 80 kilometers of the Gaza Strip, which is as far north as Tel Aviv, to open the shelters, the public shelters, for people. WORONCZUK: Yousef, gave us an update on the recent news that five Palestinians had tried to enter Israel from the Gaza side. AL-HELOU: Well, according to Hamas, they said that five of their fighters, they tried to penetrate the border and sneak into the Israeli side to carry out a military operation, and they were confronted by Israeli border forces, and they said that they killed the five Palestinians. And now this is the first incident that Palestinian fighters from Gaza, they try to sneak into the Israeli side. In another development, just moments ago Hamas announced that it has detonated a booby-trap panel near the border of Israel, near the Karam Abu Salem Crossing, the main commercial crossing, and as a result, Israeli warplanes, tanks, pounded that area heavily and the drones and F-16 jets still hovering the sky over Gaza. WORONCZUK: Okay. Lia Tarachansky and Yousef Al-Helou, thank you both for joining us. TARACHANSKY: Thanks for having me. AL-HELOU: Thank you. You’re welcome.